I’ve read somewhere that we can retrain ourselves to eat healthier, resulting in cravings for more good for you treats rather than junk. Not sure if it’s true, but I can tell you over the last couple of years we’ve made a concerted effort to reduce the amount of pasta, white flour and sugar we eat in this house. I’ve even tried, when possible, to cut out white rice and white potatoes. I say when possible because honestly, there are times when dinner screams for roasted potatoes, and a little basmati rice never killed anyone, right? Now I find myself craving things like butternut squash, lentils, beans and oddly enough, eggplant. 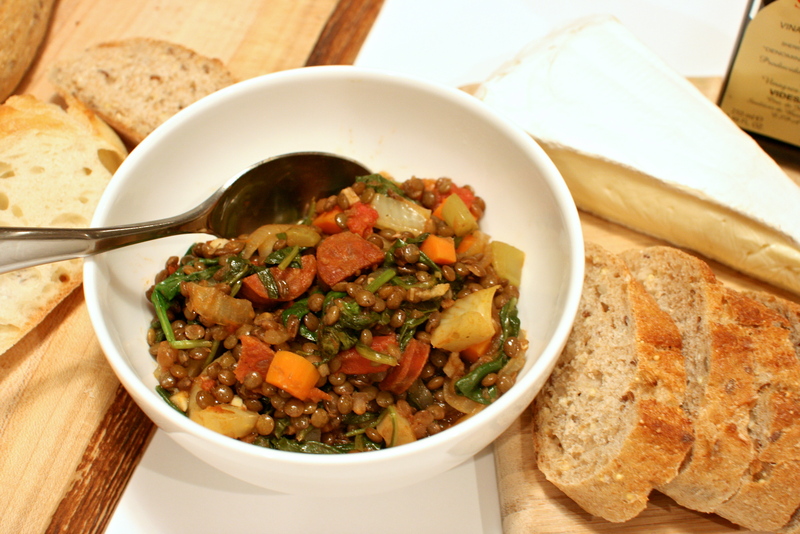 This lentil dish fulfills one of my healthy cravings. Lentils and spinach, two super foods! Obviously, the chorizo adds a bit of sin and fat, but it packs serious flavor. 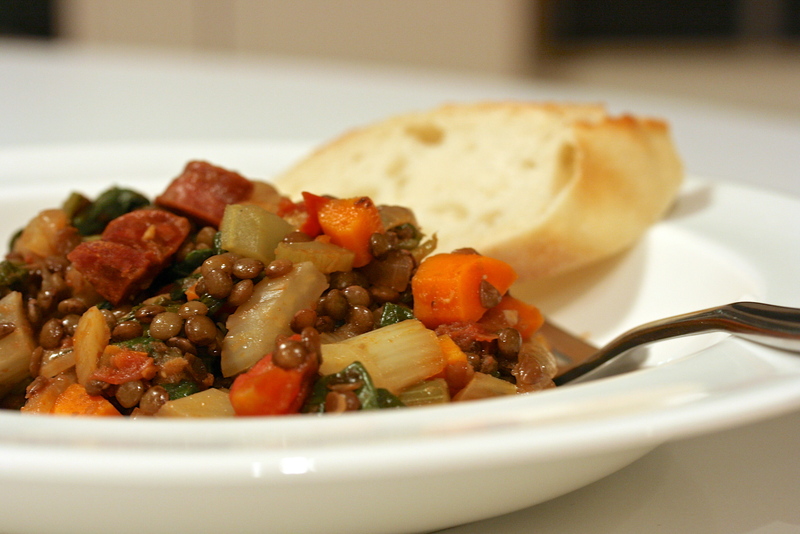 You can certainly make these lentils without it, which I have, and they’re equally delicious. This also makes a perfect side dish. 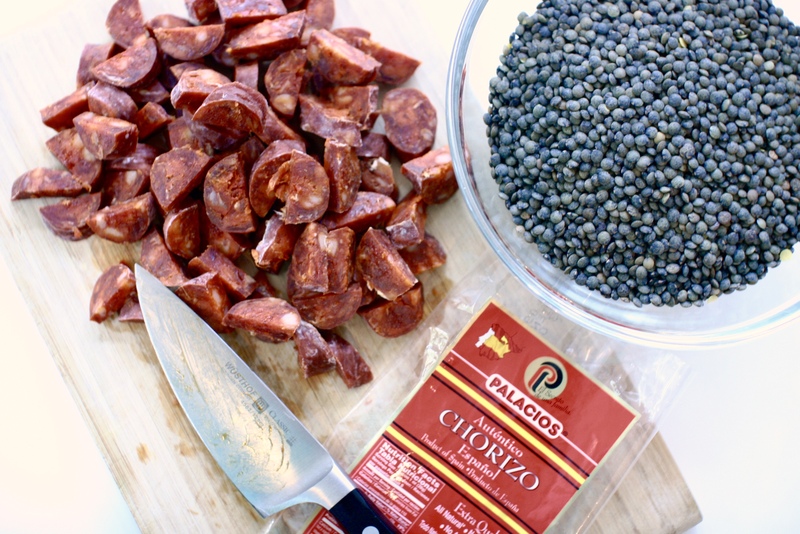 If you want to use chorizo, I recommend the brand above. For my Bucks County locals, you can find it at Jamie Hollander Gourmet Foods in New Hope, PA or None Such Farms in Buckingham, PA. If you can’t find sherry vinegar, you can substitute red wine vinegar. * Leaving the vegetables whole in the pot with the lentils will make it easy to remove them when they are finished cooking. * The vegetables should be diced in similar size pieces for even cooking. Rinse the lentils and pick through. In a medium (4qt) saucepan place the lentils, 2 smashed garlic cloves, 1/4 onion, 1 stalk of celery, 1/2 carrot, bay leaf, a few whole sprigs fresh thyme. Fill the pot halfway with water, ensuring the vegetables are completely covered. Bring to a boil and reduce to a simmer for about 20-30 minutes until lentils are tender but still a little firm. Taste them halfway through to make sure, you don’t want to over cook them. Drain the lentils through a mesh strainer, reserving 1 cup of the cooking liquid. Pick out the vegetables, bay leaf, garlic cloves and thyme sprigs. Set the lentils aside. Heat a large (5-6 qt) sauté pan on medium-high and add a little olive oil and the diced chorizo. Saute the chorizo until it begins to render its color, about 2 minutes. Remove chorizo from the pan using a slotted spoon and place on a paper towel lined plate, set aside. Discard all but 1 tbsp of fat remaining in the pan. Set pan to medium heat and add the diced carrot, celery, onion and minced garlic, season with salt and pepper and sauté until they become tender. Add the tomatoes, spices, thyme leaves, cooked lentils and chorizo back into the pan. Pour in the vinegar and 1/2 cup of the reserved cooking liquid, combine and simmer for about 10-15 minutes. Add additional cooking liquid as needed. You want the lentils to be slightly saucy. Stir in the fresh spinach. You may need to add it in batches as it wilts. Taste one more time for reseasoning and serve. Enjoy with some rustic bread and cheese. We love it with manchego or even brie.